Kirsten discovered her passion for singing at the early age of four when her grandmother brought her to church choir rehearsal. Little did she know that would spark a journey from performing in countless choirs and musical theatre productions to directing children’s theatre shows across the country. Now, Kirsten calls Orlando home and focuses on guiding and developing talent. Contagiously enthusiastic, Kirsten’s passion inspires those who are fortunate enough to work with her – driving them to work harder and accomplish more all while enjoying the process. 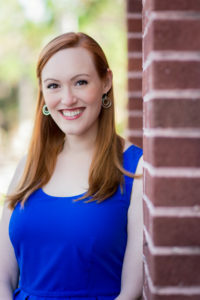 Though she earned a degree in Musical Theatre from the University of Virginia and has accumulated years of professional experience in that field, Kirsten has enjoyed studying all vocal styles from classical to belt to contemporary rock/pop to find the right blend of techniques for her own voice. She now uses this knowledge to discover the best strategy for her students. While healthy vocal development is the focus, Kirsten is passionate about cultivating a performance – whether the end result is for an audience or not. From an operatic aria to Katy Perry’s latest hit, every song tells a story. Kirsten believes it is important to create an in-depth learning experience by examining the message, emotion, and background of each song. When not teaching, Kirsten actively performs with Central Florida Community Arts and various theatres in Central Florida. Recent performances include the title role in Mary Poppins (Spotlight Theatre), Kate McGowan in Titanic: The Musical in Concert (CFC Arts), and Betty Haynes in White Christmas (Athens Theatre Company). Kirsten loves guacamole, owns an embarrassingly large collection of Mary Poppins paraphernalia, and oddly enjoys color-coding and organizing. You can visit her personal performer page here.